LONG BEACH, Cali. 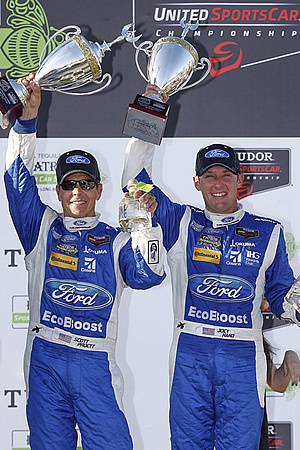 (April 19, 2015) – Chip Ganassi Racing with Felix Sabates (CGRFS) with drivers Scott Pruett and Joey Hand finished second in the Tequila Patron SportsCar Showcase in Long Beach for the first 100-minute sprint race of the season. Pruett took control of the No. 01 Ford EcoBoost Riley for the opening stint of the race after qualifying in the second position. The No. 01 trailed behind the No. 10 Corvette DP for the first quarter of the race before taking control of the lead after staying out two laps longer than the remainder of the 17-car field. The team pitted on lap 40 for four Continental tires, a full load of fuel and a driver change. Hand returned to the track in first position however the No. 10 was able to regain the lead at the 55-minute mark after making contact with the No. 01. The No. 01 navigated the 1.968-mile street course, staying within one-second of the race leader, but was unable to recover the lead. Hand crossed the finish line in the second position and secured a sport on the podium. The next TUDOR United SportsCar Championship race will be the Continental Tire Monterey Grand Prix Presented by Mazda at Mazda Raceway Laguna Seca in Monterey, CA on May 3.  The No. 01 Ford EcoBoost Riley led a total of four laps in the Tequila Patron SportsCar Showcase.  This was the second podium finish for the No. 01 Ford EcoBoost Riley in the 2015 season out of three races.